Thursday 28th September – Smiddy Bar – Daviot. The “FIrst Thursday” session on Thursday 7th September will be in the Northern Lights in Hatton of Fintray. The “5th Thursday” session on Thursday 31st August will be in The Square Bar & Lounge, Kintore. Thursday 24th August – Smiddy Bar – Daviot. 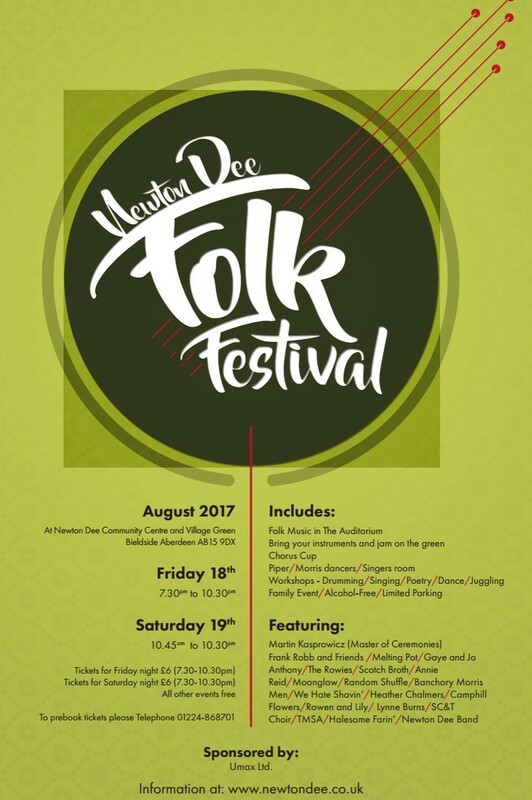 As you’ll see from the attached poster and programme the Newton Dee Folk Festival is taking place on 18 & 19 August 2017. The festival offers a terrific and varied programme. Many of the Saturday daytime events are free and the evening concerts off great value for money.